I’m the kind of person that can eat ice cream any time of the year. Even if it’s snowing if somebody asks me if I want ice cream the answer will be yes. So with the sweltering heat that has set in way too early around here, I’m talking 100 degrees the rest of the week, it’s about time for the first batch of popsicles for the summer. And the only thing that can make homemade pops better is to add booze. Am I right? And then you don’t have to share with as many people. Nope kids, these popsicles are for grown ups. If they ask why, tell them there is broccoli in them. That works in my house at least. When I was brainstorming some popsicle ideas, cocktails kept popping into my head and specifically margaritas. They just scream summer to me so I knew it would be a fun twist to combine the two into the ultimate summer treat. And not to toot my own horn, but I was totally right. 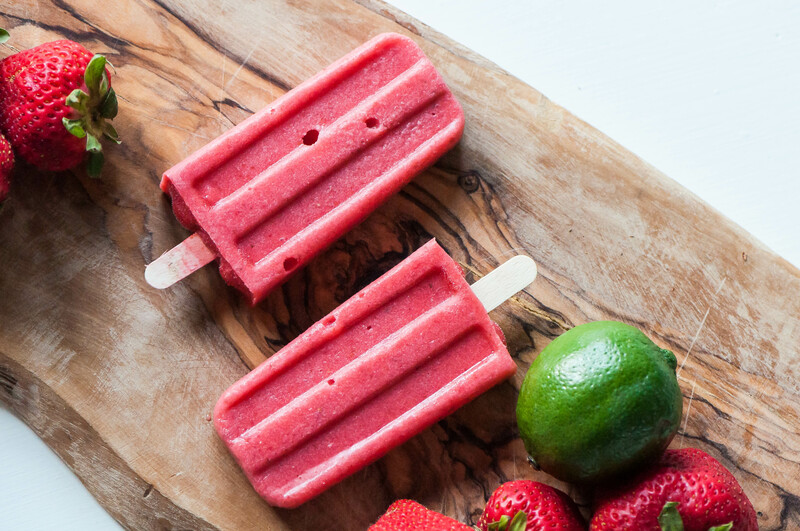 These Strawberry Coconut Margarita Pops are so dang refreshing and delicious. Sweet strawberries and cream of coconut (found with the mixers) combine with the classic lime zip, tequila and triple sec to create a cocktail on a stick. They stay just the tiniest bit slushy due to the alcohol but not to the point where they melt before you can eat them up. Because, believe me, they’ll be gone in an instant. They seriously taste exactly like a strawberry margarita. I even gave one to Joel without telling him what kind it was and after taking a bite, he told me it tasted like a margarita. Boom. I love the nod to tropical the coconut provides and it bumps up the summer factor even more. But if coconut isn’t your thing, leave it out (you may need to add a bit more sugar). Or replace half the strawberries with pineapple then lay out back by the kiddie pool. It’ll totally feel like a tropical beach. I promise. If you want to make these non-alcoholic simply leave out the tequila and triple sec. If they are too thick to pour, add in a little coconut water until you reach the right consistency. They won’t taste quite as margarita-esque but you’ll get the idea and they will still be super refreshing. And now I’m going to go inhale one or three of these while the kids play in the pool and complain about why they don’t get homemade popsicles in the middle of the day. Because I’m a grown up. Combine all the ingredients in a blender and blend until completely smooth. Pour into popsicle molds (or Dixie cups) and insert popsicles sticks. Freeze for at least 4 hours then enjoy.